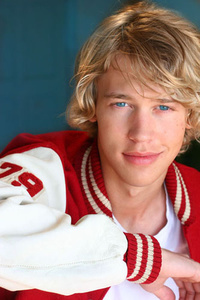 Austin Robert Butler (born August 17, 1991) is an American actor, singer, and model. He is known for his roles as James Garrett in Zoey 101, James "Wilke" Wilkerson in Switched at Birth, Jordan Gallagher on Ruby & The Rockits, Jones Mager on Life Unexpected, and Sebastian Kydd in The Carrie Diaries. This webpage uses material from the Wikipedia article "Austin_Butler" and is licensed under the GNU Free Documentation License. Reality TV World is not responsible for any errors or omissions the Wikipedia article may contain.